Have you been doing any thrifting lately? I’ve been very good at being very picky about what I bring home these days, but recently there have been a few funtabulous things that I just couldn’t resist. Do I need another collection? Absolutely no! But of these, absolutely yes! They were only 50 cents a piece, and storing them won’t take up a lot of room. They’re so fun, and I can see an art display on a wall of a whole bunch of them. 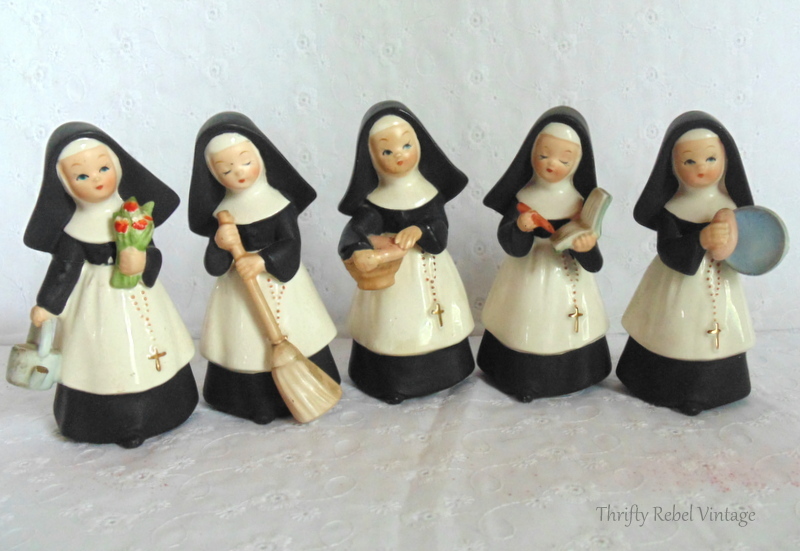 I have never seen a nun figurine at a thrift store before, let alone a set of 5. 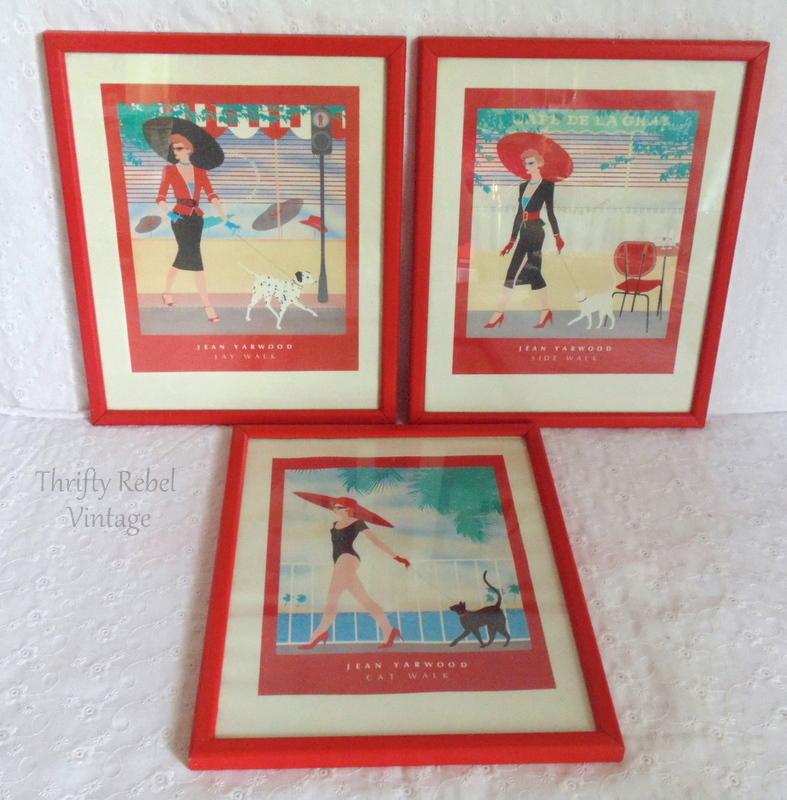 For $3, bringing these vintage ladies home with me was a no-brainer. They’re so adorable, and in pretty good condition. They’re all marked Japan, and two of them have a OCC label. I’m hoping that means Occupied Japan. They’ll probably go into my etsy shop eventually, but I need to do more research first. Even though I’m so not a fashionista I had to buy these vintage 1980s Jean Yarwood pictures because of the awesome colors. I got these for $1 each, and I’ve seen sets of two on Etsy for over $50, so I think I scored pretty good with these. 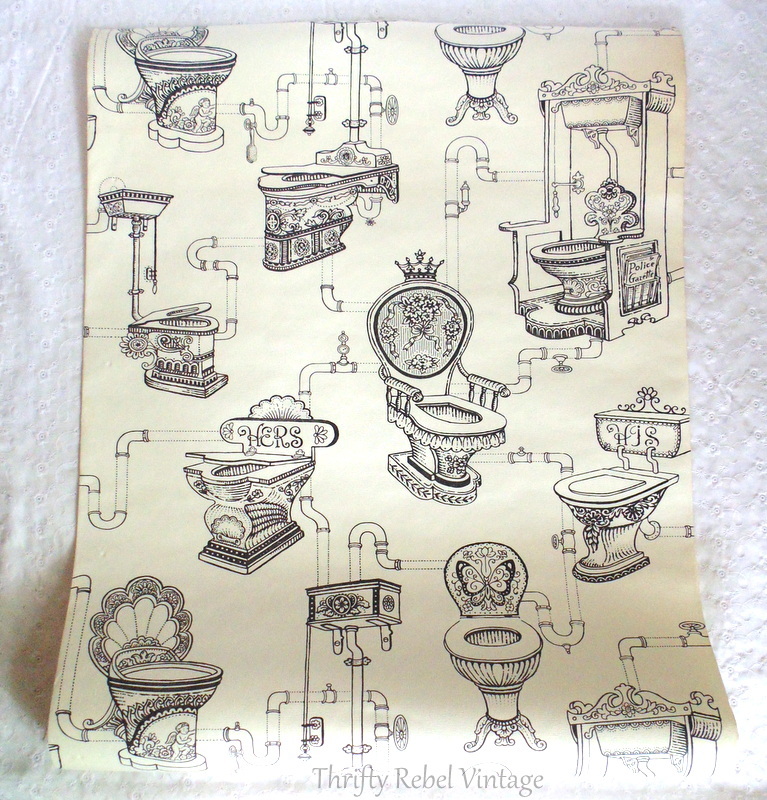 And my most favorite find, because it makes me chuckle, is this $1 roll of fabulous toilet bathroom wall paper. Check out these thrones! Aren’t they funtabulous? I did some research on google and it’s made by a company called Graham & Brown in Australia, and it’s called loo loo. lol. It’s just one roll, and buying it new is not cheap… so this will be it. This wallpaper is so cheeky, and I just have to think of a a fun way to incorporate it into a project for one of my bathrooms. 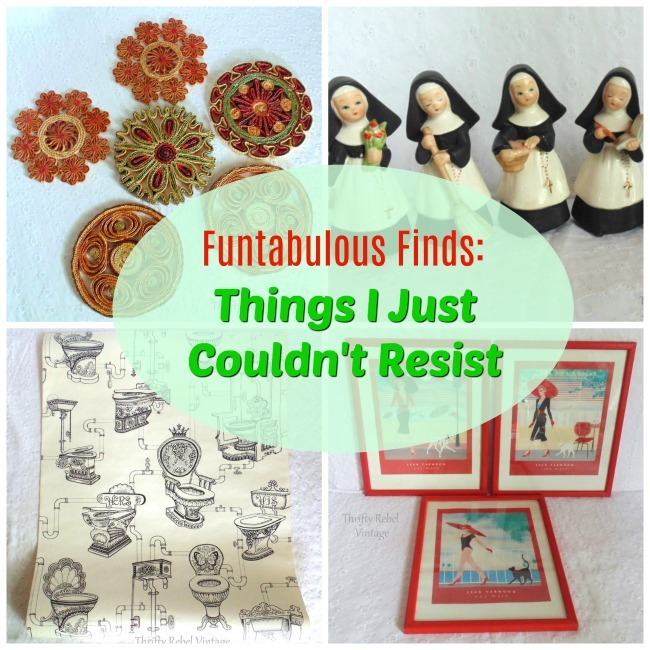 All very cool finds! It’ll be interesting to see what you do with the throne wallpaper. That’s so funny. Isn’t it! I had never seen anything it before, and for $1 it was an easy decision to buy it. Love all your finds…you did very good finding things. I like to collect things, too, but then don’t know what to do with them. If someone likes them I just give them away. Makes room for next collection. Nice finds, Tuula. The Japanese figurines should be worth some $. I have some angels that my mother had on a Christmas wreath marked Japan. When I’m ready to sell them I hope they will be worth a nice sum. Thanks Diana! 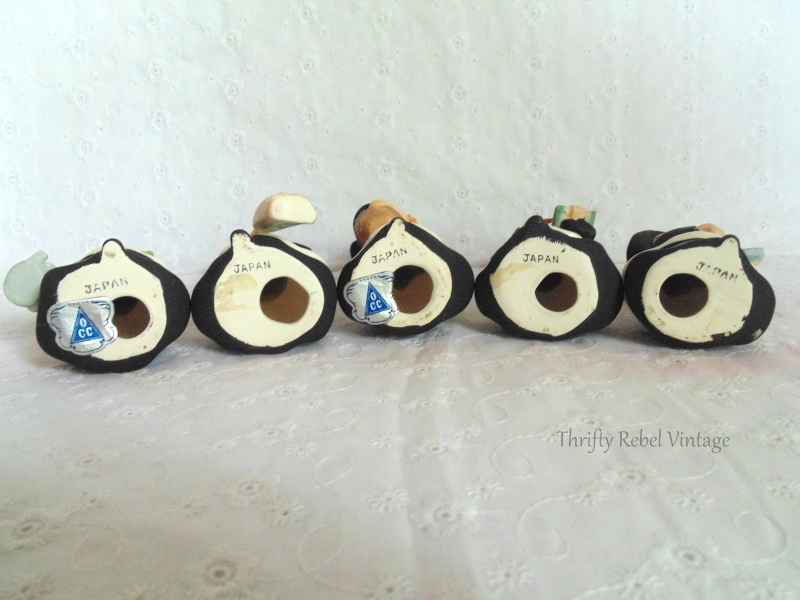 I’ve found some nuns that are similar but have a different label on them, and they were in an etsy shop of $60 for four musical nuns. Not sure how mine would compare, but I’ll keep looking to try to find the same labels. I would not be able to pass these treasures up either! Great finds, Tuula! Thanks Candice! Especially when they’re so inexpensive. I pass up the things that I think are too pricey. Love love love the nun figurines! I would use that wallpaper in the back of a shelf or on a cupboard door. I can’t wait to see what you do with it. 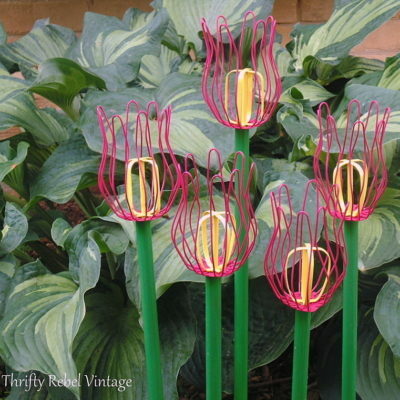 Knowing you, you will take a hot pink marker and colour some of those “thrones” in your signature style! What a fun find?. Love those finds Tuula! The fashionista pictures are cool, and the wallpaper is fabulous! I know you’ll think of something fun to do with it. I would have snapped that up too. Love the trivets, and have always had good luck selling those. Thanks Florence! When the price is so right on cool things it’s hard to resist… so I don’t even try. I had those hot plates in my first home and I stuck them on nails on the cabinets that were to the left and right of the sink, that way, hot plates were always at hand. I think they’re somewhere, blast from my past. I lined the back of my medicine cabinet with wallpaper, or you could cover a trash can or bin for toilet paper or magazines with that loo paper. 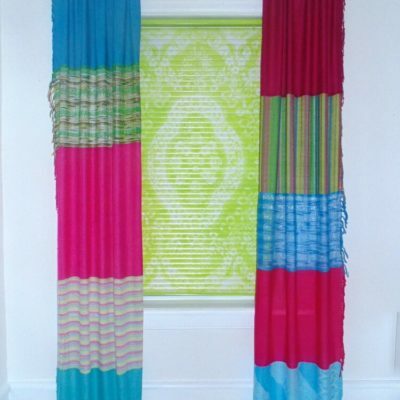 I would absolutely paper at least one wall of my guest bathroom with that quirky design. So fun! I imagine it would bring a smile to many guests faces! I LOVE THE TRIVETS. I WONDER WHERE MINE ARE? I LOVE that wallpaper! I am redoing my bathroom in black and white Victorian style. That wallpaper would be perfect framed on the black wall. 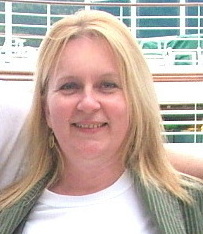 Wow AnnMarie! Your bathroom makeover sounds so fun. I’ll look forward to checking it out. Those are some great finds! I love the nuns and they would have definitely come home with me. And who knew toilet paper could be fun… Hope you are doing well Tuula. I’ve missed blogging . Any leftovers from your wallpaper, you could use to wrap presents with. That a great idea Beth! 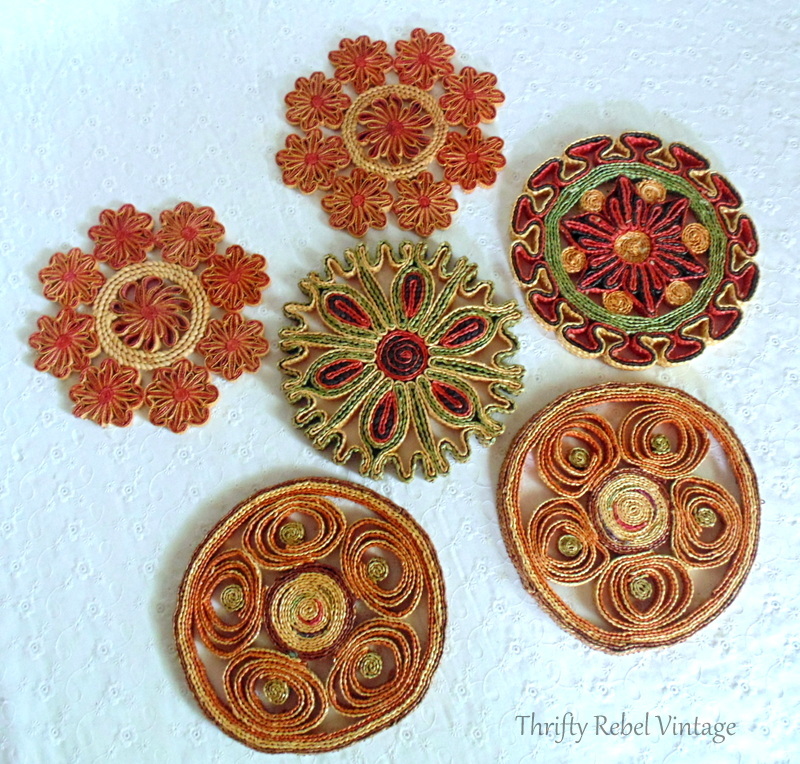 I love the woven trivets! My mom had some when I was a child. Thanks Rhonda! They were a fun find that’s for sure.